While Japan got to enjoy Rondo of Blood and we overseas had to deal with emulation until we got re-releases of the real deal, there was already a port for the SNES that was more available. But would you believe me when I said I got to beat Rondo of Blood before this entry? There are a couple of reasons for that. First, I wanted to actually own this game, which took a while since it was not released on Virtual Console until much later and a physical copy was hard for me to invest in, even though I am a huge fan of the series. The other reasons I will share with you now. I was not expecting Vampire’s Kiss to be a perfect port, but the developers seemed to think similarly, as this entry became remade into an original title instead. Besides the story being similar, Richter still sports his stiff jumps, whip and subweapons. Let’s start with his arsenal. Like in Rondo of Blood, he will always have a fully upgraded whip, with good reach and strength, making it a reliable weapon. Due to only being able to hit left and right, he must rely on his sub weapons again, which have ammunition depending on the amount of hearts you have. Sub weapons are daggers that fly far, boomerang-crosses for double damage, axes thrown in an arc, holy water to make the ground burn, and the stopwatch to stop time for a bunch of hearts. Yes, the bible is gone, which is unfortunate, but not a terrible loss. It helps that the item-crash returns, for some devastating attacks, depending on the sub weapon you have. For example, holy water will create holy rain and pour down from the sky, while daggers will throw plenty of daggers faster than I can count. They do consume a lot of hearts, and it is a shame that the counter does not indicate when it can be used like before, making it at times a guessing-game, since each item crash uses a different amounts of them. Next is our heroes’ maneuverability. Richters jumps are still stiff, but even more so than ever before, making him quite harsh to control. However, I still found myself jumping all over the place, as his walking-speed is incredibly slow. He still sports the backflip, but it is hard to use thanks to how stiff his moves are and that the enemies have long reach with their attacks. I suppose this is as good a place as any to talk about the designs of the stages. The platforms you will have to jump between are stretched so far at times, making you easily fall to your doom, which will induce rage. Bottomless pits are nothing new, but Vampire’s Kiss has them all over the place, which will create game overs by poor jumps or knockbacks. That leads us to the enemies. They are placed in areas to take advantage of your poor maneuverability and even cheap shots at you, with some even being off screen. If they aren’t small enemies flying towards you or jumping at you, it is the skeleton-heads that will shoot projectiles at you, causing you to knockback into a pit. Then there are the areas without bottomless pits, featuring armored creatures with long-reaching weapons, that can charge at you and cause a huge amount of damage. You are ill equipped dealing with these threats as they are much faster and stronger than you. Their placements in tight-corridors simply makes them more frustrating to deal with as you aren’t very agile. Taking into account that your invulnerability-time is so short, you might take multiple hits. The stages can be creative with spinning platforms in the clock-tower and one stage having you run from a giant creature, but these are few and small segments. The layouts can be rather dull and straightforward, with enemies filling in without ever being clever challenges. Even the ability to jump on and off stairs won’t be of much help. At the very least the bosses are okay, being at least a better challenge. Due to how slow Richter moves, they can still be unfair and poorly designed, and their creativity is nothing great. Also, the last fight is the most frustrating boss-fight I have ever encountered. Thank God for unlimited continues and a password-feature, otherwise I honestly don’t know what I would have done. There are no stages that made me intrigued by their designs, thanks to poor enemy-placement, Richter’s underdeveloped skills, and the outright boring or frustrating levels. At least some creativity was taken to a couple of stages, and some effort in making something original, but even those seeking a challenge, will see how unpolished this entry is. The game starts out well, with a burning town in the background while you venture through. The flames are impressive for the system and the locations you will visit are varied. Sadly, most locations are forgettable, as many don’t feel connected or don’t have much details to them. From a rooftop that consist of dark green walls, you end up in a hallway full of statues that are more repetitive in the visuals than unsettling. In fact, some can be quite muddy in terms of looks due to the lack of colors or any personality. It makes each location dark, but also dull. I can only recall 2 areas that really were intriguing, such as the aforementioned town at the start of the game, and the clocktower towards the end, but most aren’t that interesting. 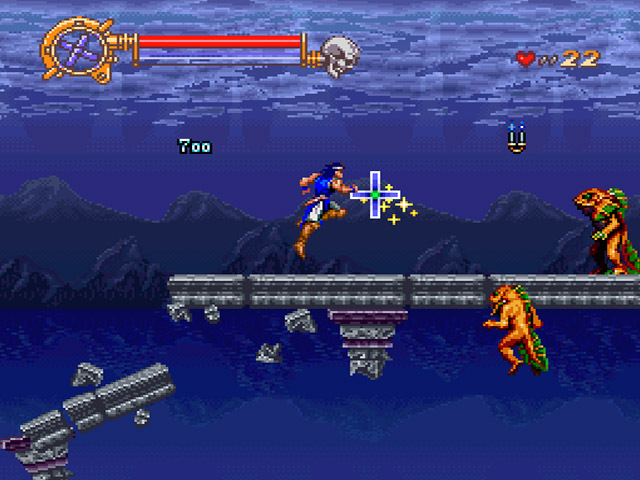 The same can be said for the enemies as while there are is a selection of varied creatures, the game seems to favour just a few of them, such as the spear-guards, skeletons, and the crows. This also prevents some levels from becoming memorable, despite some new creature coming forth. The bosses are detailed creatures that are both staples of the series. and some newcomers. While they are well made visually, their animations are incredibly stiff and they almost look like paper cut-outs. The same can be said for some enemies that have darker outlines, which makes them more cartoony than the rest of the cast. It all looks good, but not creative or engaging, especially in motion. That being said, the music is still incredible, taking good advantage of SNES’ capabilities with most of the tracks being present here. Some alterations have been made, but nothing feels better or worse. It is almost like if Capcom took the dark melodies from Konami and gave them their alteration with more blow-instruments. However, they still recognize the dark tone of Castlevania, giving instruments like the organ time to set the tone for the more intriguing music-pieces, like the pump-inducing Bloody Tears. Yet, they also give rockin tunes such as the first stage theme, with an electric guitar. Despite the shift with music-instruments, it is as energetic as the other themes. All are great, memorable, varied, fitting, and a treat. There are two maidens you can save if you get a key from a previous level and don’t fall into the alternative stages. This is not a bad idea to create replay value, but due to how unforgiving and poorly designed the levels are, it becomes a drag to save them. Not to mention the fact that the keys will take up the slot for subweapons. At least it is neat that this both affects a bossfight and which ending you will get, but that is all the praise I can give it. You have enough to struggle with as it is, so these damsels aren’t worth it. Castlevania: Vampire’s Kiss is a below average experience. I did not expect a perfect port of Rondo of Blood, but what we got, was a broken game that did not have any idea on what made Castlevania so great. It is hard to recommend this, even if you are a glutton for punishment and especially since Rondo of Blood is easier to get your hands on these days. Maybe this one is better forgotten. Challenge should come from creativity and clever designs, not by making you remember every part of a game.